Can’t find as much time as you’d like to go to the range and work on your game? 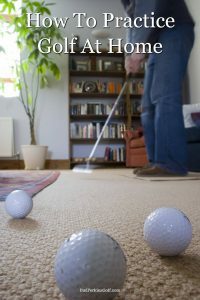 Wondering how to practice golf at home? Here are some drills you can use to improve your game at home. If you want to get better at golf you are going to need to log in a lot of hours practicing, but sometimes finding a spare moment or so to go to the range can be difficult. The good news is that you don’t necessarily need to, once you know how to practice golf at home. While beating balls is always the preferred way to get better you can still improve your game without leaving the house. Today we are going to be helping you do that by providing you with a few drills you can do from home. For ease of use, we will divide the drills up into sections based on what aspects of the swing they are designed to improve. When golfers talk about lag they are referring, essentially, to the angle of your wrists as your club reaches the impact zone on your downswing. Most tour players incorporate a pretty significant amount of lag into their downswings as it adds a great deal of power, but it is an aspect of the swing that many amateurs struggle with. Here are a few drills that will help you to add lag (and as result, extra yards) to your golf swing without ever needing to leave your home. For this drill, you will not need to leave your house, but you might want to head outside if you have low ceilings. To perform this drill, you will need to flip a club upside down and grip it near where the hosel of the clubhead meets the shaft. After that, take your typical golf stance, and draw the club back until the shaft is nearly parallel to the ground. At this point you will initiate the downswing but rather than bringing the club down through the “impact zone,” the goal is instead to drop your wrists down to your hips as quickly as you can, and then stop. This motion will create the feeling of what your wrists should be doing as the club reaches the hip level and prepares for impact during the downswing. If you can replicate this move during your real golf swing, you will find that it will add effortless distance to your swing. This is a drill that can technically be done just as readily at the range as it can be at your home, but I include it here because you do not need range balls to make it work. The point of this drill is not where the ball goes when you perform it, but rather the feel and habits that it instills in the downswing. Performing the drill is as simple as its title suggests it would be. To do this drill the traditional way you will probably want to take another trip outside because it will require you to make full swings with a golf club. Once outside, put your feet together and start swinging the club the way that you normally would. Keeping your feet together will prevent you from moving your body much. As a result, you will really get the feeling of the angle that your wrists should have as you descend towards impact. Conversely, if you cannot go outside for some reason you could perform this drill indoors miming the swing rather than using an actual club. For best results, however, you may find it more beneficial to use an actual club whenever possible. The hip turn is a very simple aspect of the golf swing that is often done the wrong way. If you find that you slide your hips rather than turn them here is a drill that you can use to quickly fix it without ever even stepping outside. To perform this drill, all you need is a basketball. You’re going to want to wedge a ball between yourself and the wall, and then work on pivoting your hips and shoulder. The basketball, in this case, is going to give you feedback on how you are doing. When you pivot your hips correctly, the ball is going to stay in place. When you don’t, it will drop to the floor. The purpose of the drill is to train you not to move laterally away from the ball. As a result, you will enjoy a more consistent shot pattern as well as longer distances. You don’t need me to tell you why it’s important to brush up on your putting. Here is a drill that you can use to improve your stroke. To perform this drill all you need is two thick books, a ball and a putter. Line the books up parallel to one another leaving only enough room between the books to fit the putter head and ball. After that you are simply going to start hitting putts between the books. How does this drill help? It trains you to maintain a proper path through the ball. The result is going to be a smoother, steadier stroke. To work on distance control with your putter you are only going to need two balls and a putter. Set one of the balls ten feet or so from the other and try and hit it without making the second ball move. This drill is going to help you learn to regulate your distances with the putter which will ultimately result in fewer three putts. Knowing how to practice golf at home lets you work on your game even when you don’t have time to visit the range. As you can see, there are plenty of drills out there that you can use to get better without ever leaving the comfort of your home. Many of them you can do without even stepping outside. Naturally, going to the range where you can get real-time feedback on your practice sessions is always going to be preferable, but when that isn’t an option these drills will always be a good way to improve. Even the busiest player will experience lower scores on their next loop if they practice these golf drills at home. What more could a golfer want?